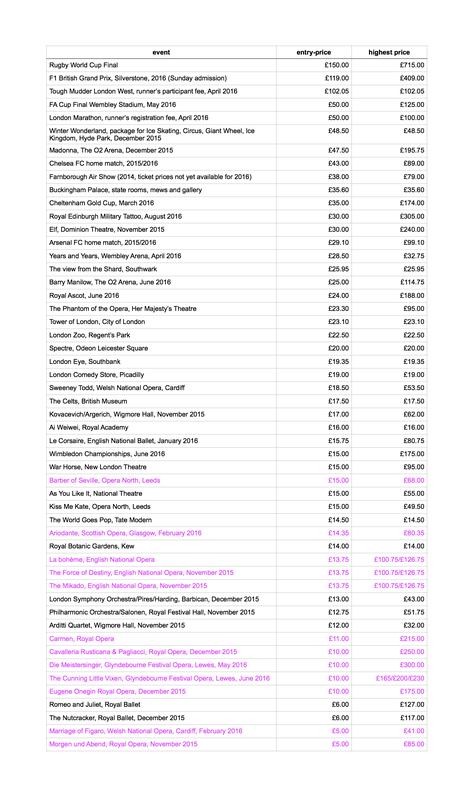 In the week when another senior journalist, this time from the BBC, has felt it necessary to raise the question of opera ticket prices (even if the interviewee’s response successfully dismissed the “expensive” label used), it is more than timely to update the price comparison previously published in November 2014. The basic premise of the comparison is that opera tickets are sold at a range of prices, not at a single price-point. That’s something obvious to those who actually buy opera tickets, and generally obvious to those who have some notion of ticketed events – but bafflingly out of the mental grasp of leading media journalists, commentators and presenters. There are some opera tickets which cost more than £100, but so do the top price tickets to many other comparable events and activities. Only a few hundred of those top price opera tickets are available given the small size of theatres and handful of performances of each opera, whereas tens of thousands of the top price sports and pop concert tickets are available for sale. Yet, those other activities are not routinely denigrated as “expensive”, and their participants are not forced to defend the entire sporting or cultural sector in every single mainstream media discussion – in the way that Jonas Kaufmann and Thomas Hampson have been by BBC presenters. Certain events are far more expensive than opera, by any measure. The losing event in the previous comparison was the series of concerts performed by the Rolling Stones at the O2 Arena in 2012, where ticket prices ranged from £90 to £375. This time the new losing event is the Rugby World Cup Final at Twickenham, where ticket prices start at £150 and top price tickets are £715. It’s not yet known which teams will be playing in the final. If I were paying that much for an opera ticket (I wouldn’t anyway), I’d want to know in advance which opera and which performers would be on stage on the evening. The problem is that many journalists, commentators and presenters across the whole mainstream media simply have not checked their facts about entry-prices, and make the lazy, ignorant mistake of taking the small percentage of opera tickets sold at the highest price-point to represent the full range of tickets available. The entry-price (i.e. the cheapest ticket available for a performance or event) for opera is more or less the lowest entry-price of anything comparable. Let’s rephrase that, for all those suffering from opera-cliché syndrome: tickets are available for operas at cheaper prices than for any major cultural, sporting or tourist activity. 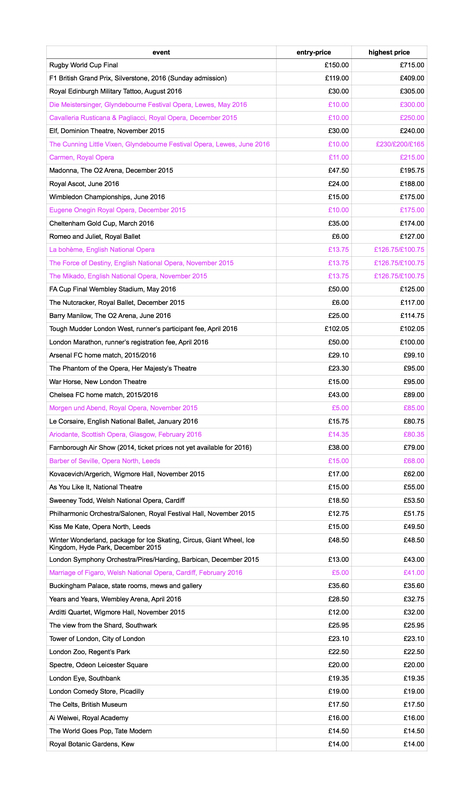 This October 2015 comparison looks at ticket prices for staged productions by large opera companies, in their home theatre. (Ticket prices for opera performances on tour are partly outside the control of the opera company, depending on the receiving theatre fees.) The opera data are shown in magenta. The comparison is made with other arts performances produced mostly by large-scale or national companies, with gallery and museum special exhibitions, pop music concerts, musicals, tourist attractions, and a range of sports events and games. This is a selective list – but consistent in mainly covering productions, events and attractions which have a large number of professional performers or operational staff, or which require considerable logistic effort to prepare. All locations are in London, unless stated. Some events have a single ticket price, which is shown both in the entry- and highest-price columns. 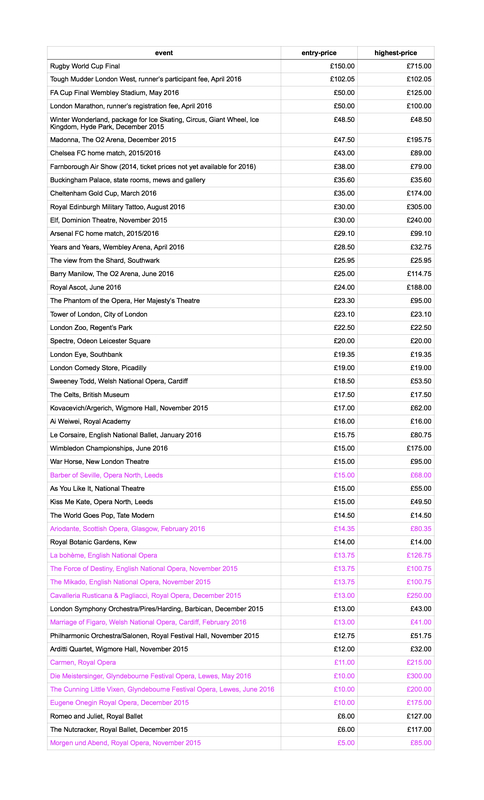 All prices shown are for October 2015 events, unless another date is specified. The prices are for standard adult online tickets. Booking fees and venue improvement levies are included where it is not possible to opt out from paying them. It must be noted that opera houses and concert halls (and some other venues) charge the booking fee *per transaction*, regardless of how many individual performances are included in the transaction. So for example, buying a ticket for both La bohème and The Force of Destiny at English National Opera would cost from £25.75 i.e. £12 per ticket and one fee of £1.75. It must also be noted that the price ranges for many operas vary depending on the date of performance; the cost difference in top price tickets at Glyndebourne for The Cunning Little Vixen, for example, is £65 across dates in June and July 2016. The ticket prices for all items in the comparison do not include any extras such as travel costs, food and drink, programmes (mostly), baby-sitter fees, accommodation, or clothing (£72 for a football shirt and scarf, for example) – and no, it is not normally necessary to wear any special clothing to an opera performance; even at Glyndebourne wearing black tie is effectively optional. One common, absurd accusation about opera’s supposed “inaccessibilty” is the cost of extras – which obviously apply to any event not taking place in one’s immediate home location. The inclusion of Glyndebourne Festival Opera in the list needed some consideration. It is clearly a large-scale performing arts company, but stages productions only for a few months of the year rather than the full season, and receives (for the main festival) no public funding, which means different financial criteria apply. Its range of ticket prices is therefore not as low as the national opera companies, but omitting this from the comparison could have been considered misleading. Classical music performers and venues should be congratulated on their efforts to attract new or younger audiences through reduced price or free tickets. Welsh National Opera offers tickets for £5 in all parts of the Millennium Centre theatre to those under 30 years. The Wigmore Hall also offers tickets for some concerts at £5, to those under 35 years. English National Opera runs a Secret Seat scheme, where a £20 ticket gives you a seat allocated a few days prior to the performance – experience suggests these are usually top price seats, representing a pot-luck saving of £80 or so. English National Opera also has substantial discounts for people under 30 years, as well as discounts when tickets for several operas are booked in one go. The Philharmonia Orchestra has a series of short contemporary music concerts (Music of Today) where all tickets are free. And for some concerts, the Wigmore Hall also offers free tickets to people under 25 years old. That seems to represent a sensible use of public subsidy, though a full discussion of arts funding (or lack thereof, in the UK’s case) lies outside this particular blog post. It is worth stating however, that the question of public subsidy for the performing arts cannot be addressed in isolation. There needs to be full transparency from the UK football businesses (the correct terms for clubs) regarding the hidden state and local subsidies they receive through infrastructure, services and especially for police costs. When taxpayers’ money is used to enhance the cultural life of the nation, confused libertarians and philistine far-right commentators in certain newspapers consider it a scandal – the real scandal is that it is accepted and deemed an essential requirement for taxpayers’ money to be used to prevent attendees at a game from fighting each other, assaulting bystanders or vandalising property. The other scandal is that, in a multi-billion pound business, the football companies do not pay a living wage to ground staff, and expect government to fund grassroots football facilities and training – yet still charge ticket prices that should be routinely termed expensive as a cost-yardstick far and wide, and levelled as a daily accusation against every professional footballer in all media appearances. The data shown is taken from website of the respective organisations. If anyone would like to use the ticket-price comparison table in their own blog or publication, I’d be grateful for a credit and a link to this blog post. In turn, I should credit @boulezian on Twitter for drawing to my attention the BBC interview with Jonas Kaufmann broadcast on 16 October 2015, and who, unwittingly, provided a couple of ideas on which I have expanded above. The first table is sorted by descending entry-price cost, the second by descending highest cost. The above is now an updated version of this post, following the welcome attention the original received across social media in the 24 hours since it was first published (4,500 views and rising steadily). I’m grateful to everyone who has retweeted, reblogged, or otherwise reposted it, and for all the comments received. First, the tone of the original opening paragraph was unhelpful, even though I was expressing the deep frustration felt by many people about the mainstream media’s persistent confusion over the cost of opera tickets. The journalist whose interview stimulated this post may have felt misrepresented; though, given I had sent the original link to him, it would have been useful if his reply had been made direct to me rather than through third-parties. I hope the paragraph is now fairer; it was not my intention to pick on an individual and I’m obviously sorry if that’s how it was received. Second, I have updated the tables following a couple of suggestions from readers. In come the UK Formula 1 Grand Prix ticket prices, and the entry-price for operas at Glyndebourne is amended (the correct figure is £10 not £40). A couple of small changes were made to the text as a consequence. If any of the organisations cited need further corrections to the data I’ll obviously do so swiftly. Otherwise, I don’t plan to revisit this topic again unless circumstances change significantly; the point has been made quite clearly to most, but sadly not all, readers. One last word though: obviously I recognise that there is plenty of media commentary and debate on the cost of football and other sports tickets in general, and the Rugby World Cup tickets in particular. Many keen sports fans are priced out or rightly feel that tickets are poor value. I’m not suggesting that the “expensive” label has been applied uniquely to opera tickets, nor is this a slanging match with the sports world. The annoyance is that many in the mainstream media fail to acknowledge the existence of the cheaper opera tickets or that opera tickets have a range of prices, and show no understanding that the entry-price to opera performances is lower than most comparable activities. The “expensive” label is used routinely and gratuitously; worse, it becomes a pernicious accusation about the value of opera and everyone involved with performing it. I’m not sure anything else of such value is subject to a similar uninformed attack, and it is well past the time for journalists, presenters and commentators to drop the cliché for good. When every mainstream media discussion of opera starts with the comment “isn’t it good that opera tickets are so cheap”, or “live opera really is better value for so little money than any other activity”, then we can finally lay this nonsense to rest. Galas, jamborees, pageants, functions, ceremonies – can’t stand them, generally. Just not my cup of tea; certainly not my glass of champagne. However, I would never deny or underestimate the importance of those occasions: the social ritual to endorse an activity, the marking of beginnings and ends, the sense of celebration to make people feel things are worthwhile and, yes, to encourage them to donate money to keep the things going. When it comes to classical music gala concerts, there are often reasons aplenty to share my dislike: over-familiar repertory, music packaged for easy-listening, and above all a formality of dress and behaviour that sends out completely the wrong message to people who enjoy classical music, but have the impression that concert hall “rituals” are intimidating or unfriendly – much hard work has been done to rectify the reception concert halls give to newcomers, yet one event can still destroy that goodwill overnight. State funding of classical music in Europe, however scant, means in any case that lavish events for wealthy donors are not a commonplace philanthropic ritual across the season – at least compared to the U.S.A., where orchestras and opera companies rely heavily on fundraising events for a portion of their basic income. But in London particularly, there seems a peculiar absence of celebration of classical music culture. Maybe not so peculiar, given the ignorance and laziness of mainstream media, and the philistine anti-intellectualism of most social and political leaders. Most other capital cities which had the combined talents of Salonen, Jurowski, Oramo, Rattle (soon), Wigglesworth, of the players in the five major symphony orchestras, of the opera company members, and of all the other resident ensembles and musicians, would have a little old-fashioned civic pride about the quality and range of culture within their domain – and would make some effort to tell people. That London doesn’t, means that music seasons here generally slip in unnoticed. Not, obviously, by regular concert-goers keen to return to their favourite venues and players – but in any broader sense of public awareness. It’s partly complicated by the number of halls and ensembles: a rondo of gala opening nights across multiple venues, orchestras and companies would grow tiresome (and expensive), even though the cumulative effect could generate powerful publicity if it were coordinated. We might look across the Atlantic at the New York Philharmonic opening gala concert this Thursday 24th September (Lang Lang in Greig, plus Beethoven’s 7th Symphony, all conducted by Alan Gilbert) and shake our heads at the ticket prices (£51 minimum up to £167, including a champagne reception with the performers) – but then consider that the concert is sold out, and being broadcast live and streamed on WQXR radio. Then we look at the Southbank Centre’s classical music season opening concert this Wednesday 23rd September (Vladimir Jurowski conducting the London Philharmonic Orchestra in Mahler’s 7th Symphony), note with relief that the ticket prices are as normal for classical music concerts in London (from £4.50 for concessions, or £9, up to £65, ie cheaper as a range of prices than most other cultural, popular or sporting events) – and then, two days before the concert, wonder why less than half the seats in the Royal Festival Hall have been sold and the live concert on BBC Radio 3 that evening is from a rival concert hall with an orchestra that opened its season a week previously. It’s obviously difficult and expensive to promote one-off events in a city as full of culture as London, and it’s never entirely clear why some concerts sell-out and others (even with top performers and repertory) fail to garner an audience. But an effort can still be made, and in this case it seems almost as if the Southbank Centre has lost interest in marketing, publicising and celebrating what used to be the principal activity at the premier concert hall (at least for the moment) in the capital. A half-empty hall is always a depressing sight, dampening the atmosphere for audience members, and a poor reward for the performers. But worse, there’s a missed opportunity this Wednesday. The opening concert of a season should always be a celebration – an evening that is anticipated, discussed, and enjoyed, an event that sets the scene for all the concerts to follow, and an unambiguous reminder that classical music is of essential cultural value. It can’t be any of that without a little touch of the gala and a large amount of publicity, neither of which seem in evidence this week. Adriano in Siria is one of several of Metastasio’s opera seria libretti which were used by more than 60 composers, in this case from the first setting in 1732 by Caldara, to the last by Mercadante in 1828; earlier this year, a recording of Veracini’s 1735 version was released, and J.C. Bach’s 1765 version was staged in London. Adriano ends with a gesture of imperial magnanimity; hence many of the new versions were composed for royal occasions across Europe, such as Pergolesi’s setting, performed in Naples in October 1734, which was dedicated to Charles Bourbon, Duke of Parma and future king of Spain, whose forces had captured the kingdom of Sicily and its capital Naples the previous May. Compared to Vinci, Hasse, Porpora, et alia, Pergolesi hasn’t featured as prominently in the recent wave of opera seria revivals and aria recordings. There is however a complete edition of his operas on DVD, recorded at the 2010 Pergolesi tercentenary festival in his native Jesi, and from that set Adriano in Siria is also available as a stand-alone and on YouTube. This performance was organised by Opera Settecento, a group dedicated to reviving under-performed opera seria and whose chairman Christopher Silvester is a particular fan of this opera. Their previous events were Vivaldi’s Griselda in 2014 and Handel’s Catone in Utica in 2015 at the London Handel Festival; plans for 2016 include a return to the Handel Festival in March and another September Cadogan Hall performance of an opera by Hasse. The action of Adriano takes place in Antioch, where the future Roman emperor Hadrian as local governor has conquered and offered peace to the Parthians. He seeks an affair with Emirena, the daughter of the Parthian king Osroa. She is betrothed to Farnaspe, a Parthian prince. Hadrian’s friend Aquilo is in love with Hadrian’s betrothed, Sabina. The plot centres on Osroa’s attempts for revenge against Hadrian, who in turn is persuaded by Sabina to pardon everyone and marry her. Despite its general appeal, the music is variable: Act 1 drags (no fault of the excellent young cast or the orchestra) until the final two arias, Act 2 is the best balanced musically and dramatically, and the final act wraps things up with rather too much action and too little music. The concert-format (chairs and music stands for the singers, in front of the orchestra) didn’t hinder the dramatic involvement of the cast, who stayed in role and responded subtly to the unfolding of events. In the title role, Michael Taylor immediately established the authority and confidence of the victorious governor, with a full tone and legato maintained with careful use of limited vibrato. The high-lying coloratura was all managed with ease, and the voice balanced from top to bottom, only very occasionally thinning under pressure of the passagework. Russian mezzo Maria Ostroukhova (oddly identified as soprano in the programme booklet) produced a warm and rich sound, conveying the emotional torment of Emirena and unafraid to use the heavy voice to push fearlessly through the fast passages with mostly clear articulation. Her impassioned Act 1 aria Sola mi lasci a piangere was the first musical highlight of the evening. Following on rapidly, Farnaspe’s aria Lieto così talvolta is the most performed and recorded extract from the whole opera. Pergolesi sensibly placed this aria at the end of the act – despite being less bravura than other arias for the character and in the opera, it’s the undoubted musical standout in the work. The obbligato oboe, representing a caged nightingale, was sensitively controlled and with some genuine quiet playing. The role was originally written for Caffarelli, and all the arias were handled impeccably by Erica Eloff who maintained a clear, bright tone across the huge range required, and showed first-rate technical control in runs over the break and back. Augusta Hebbert showed similar control in the role of Sabina, including a perfectly floated held note in Chi soffre, senza pianto, though the emotion was a little generalised through all her arias. The incidental role of Aquilo was reduced further by the last-minute cut of the character’s Act 2 aria, leaving just the one Act 3 aria Contento forse vivere – with music familiar in Stravinsky’s borrowing for Pulcinella. Cenk Karaferya’s full vibrato did justice to the character’s frustrated passion for Sabina. The most sensational singing of the evening came from the tenor Gyula Rab, who is only in the second year of his professional career. Urged on by the full orchestral sound in his bravura arias, he conveyed Osroa’s desire for revenge with an impassioned, slightly Italianate sound at the top, firm tone and precision in the fast detail. Leo Duarte, busy these days as principle oboe with the English Baroque Soloists in Orphée et Eurydice, was making his operatic conducting debut this evening. The intention was clearly to keep the drama flowing, the next recitative typically pushing ahead immediately after the last beat of the preceding aria, though inevitably some clapping intruded as the audience wished to show genuine appreciation for the singers. The ensemble and tempi benefitted especially from Jonathan Rees’ excellent cello continuo. It’s a long evening for the violins, and although in a few places better attention to articulation and variety of tone would have kept the textures more interesting, the tuning and pace was secure throughout. In passing, it should be mentioned that the programme booklets for the concert were delayed, only arriving during the first interval, and the £5 charge was generously waived as an apology – although, as both a thorough proofread and a pruning of self-indulgent biographies were still needed, paying would have rankled. Eyebrows have been raised at the “Royal Opera billing” of this production, given the ad hoc chorus, dancers and orchestra. The Royal Opera House, however, is still clearly a producing house, and if extending the company to include adjunct performing groups means that the repertory is broadened and the number of performances maintained or increased, that is surely for the good. Of greater concern, is that the raison d’être of this production seems as much to be concordance both with Hofest (a month-long season of Hofesh Shechter’s work across several London venues) and with the Royal Opera’s Orpheus theme during 2015, rather than any serious attempt to rectify the lack of productions of a composer who was central to the historical development of opera as a genre from the late eighteenth century onwards. Gluck’s tercentenary in 2014 went uncelebrated by any major British company; Bampton, Buxton and the Royal Northern College of Music managed short runs of three operas out of the thirty-nine which survive complete. Further, although Orfeo ed Euridice in its original Italian 1762 version (last seen at the Royal Opera in 1991) was the groundbreaking work of “reform opera” that first moved the dramatic possibilities of the genre out of the straitjacket of opera seria and the recitative/da capo aria conventions, and even though the 1774 revision presented here was in some ways a more fully worked version of Gluck and Calzabigi’s new approach, there are arguments that Alceste (only seen at the Royal Opera in 1981), Armide (never performed by the Royal Opera), and both Iphigénie en Aulide and Iphigénie en Tauride (just the latter seen at the Royal Opera, in 2007) are all musically superior. Dramatically too, in the case of those last three works, which were the examples used by Hoffmann, von Mosel and others as the models to be followed for the creation of German romantic opera. If Gluck’s operas are worth performing for their own sake, and quite obviously they are, it doesn’t seem much to ask that a major national company chooses more carefully which one to stage. Perhaps this would all matter less if this production had been anything close to a success, rather than a collage of different aesthetics with very limited dramatic appeal. The orchestra was placed across the width of the mid-stage, on a platform that was raised and lowered at different points, other wide platforms behind and above them were raised, lowered and angled, the upper platform colander-like allowing beams of light to shine through decoratively – but all with no clear narrative consistency or dramatic effect. At least someone had found the oil can to stop the squeaking that has often been heard here from scenery. The dance company was on-stage almost constantly, mingling with the chorus and duplicating the action; for the final, long, 20 minutes of the evening they took over events with repetitious, enervating movement – yes it’s ballet music that in any case destabilises the drama considerably, but it was the clearest evidence that the dance choreography throughout wasn’t integral to the presentation of the dramatic logic, but a parallel response to surface detail in the narrative and the music. The story, characters – and singers – were all rather lost in the melee, and the limited attention to their direction led in the worst case to laughter in the upper part of the theatre at Euridice’s perfunctory death. Juan Diego Flórez has recorded the role of Orphée in French and was clearly secure with the high writing and passagework as would be expected from his Italian bel canto background. The tone doesn’t appeal to all, and some of his phrasing sounded too deliberate. Lucy Crowe managed excellent ornamentation and some vocally dramatic involvement with the character, but was swamped by the staging. Amanda Forsythe made the best impression, not through the clichéd gold lamé suit she was given, but with strong line and purposeful phrasing. My French neighbour was dédaigneuse about the quality of diction from all the singers. The playing also achieved mixed results. Ignoring the barrage of sforzandi that is Gardiner’s trademark, whilst at times there was depth of tone in full passages and sensitivity in quieter sections, too often the phrasing felt routine and the sound thinned alarmingly. For once, this intellectually unchallenging mix of spectacle met with general approval from the Royal Opera audience, at least judging by the welcome absence of booing. But neither as a dramatic investigation of a profound myth, nor as a tribute to one of the few composers who changed music decisively, could it be considered a significant theatrical achievement.